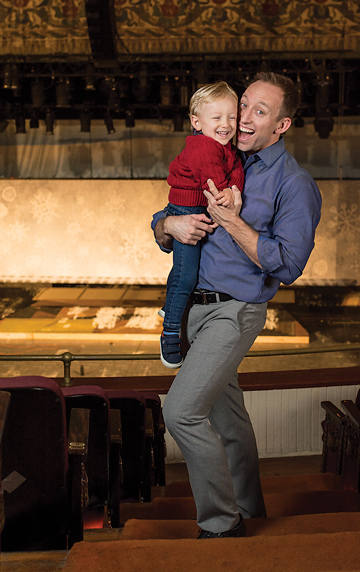 Nathaniel Shaw might not have chosen a career in theatre if his older brother, Matthew Keuter, hadn’t told him about all the fun the choir and theatre kids were having in junior high school. 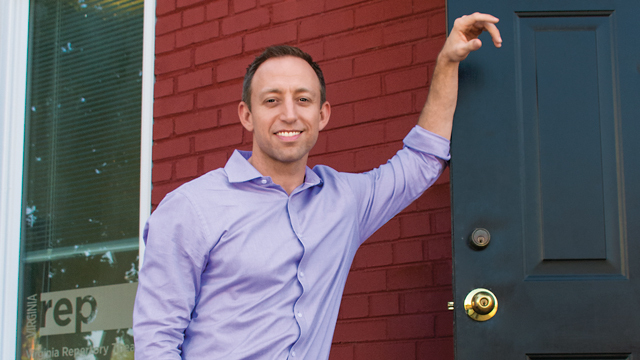 Nathaniel Shaw is Virginia Rep’s new artistic director. 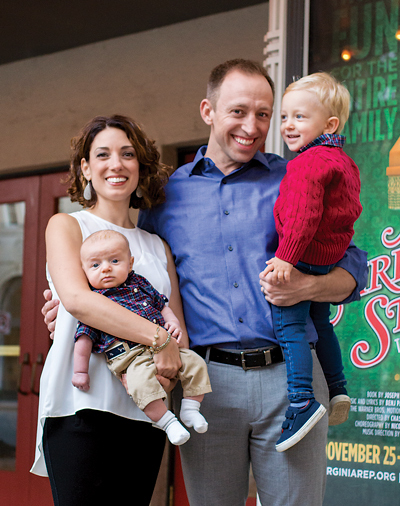 He and his family, wife Lisa, and sons Benjamin and baby Caleb, recently moved to Richmond from New Jersey. Nathaniel is more than a triple threat in the theatre world. He performed in a multitude of roles with various companies during his career, including Will Parker in Oklahoma!, the Emcee in Cabaret, Zach in A Chorus Line, and Riff in West Side Story. 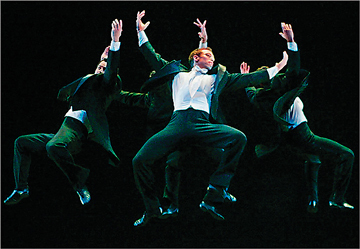 In addition to his work in the theatre, he danced for three years with the world-renowned Paul Taylor Dance Company. 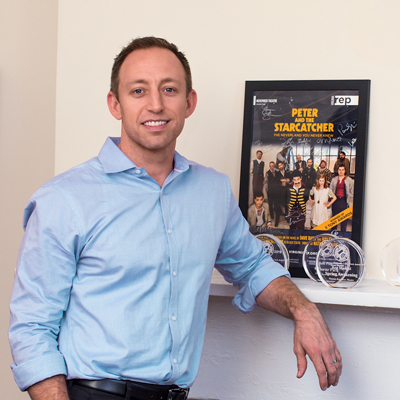 On Broadway, he served as an associate choreographer for the Tony Award-winning musical Once. His directing credits include everything from West Side Story and A Chorus Line to South Pacific and Hair. He made his Richmond debut in the fall of 2015 directing Peter and the Starcatcher for Virginia Rep. Prior to his current position, Nathaniel worked as development director with the Tony and Olivier Award-winning Glass Half Full Productions, and was responsible for sourcing new projects. He was also artistic director of the Active Theater in New York for six years. It’s take-your-baby-to-work day at Virginia Rep. Nathaniel and Benjamin clown around in the balcony at November Theatre. Back then, both dance and theatre were the farthest things from his young mind. Growing up, he was obsessed with sports, spending his time playing soccer, basketball, baseball, and tennis. “I thought my destiny was to play point guard for the Lakers,” Nathaniel says with a grin. “But I am about 5-feet-10 and moderately quick, with moderate jumping ability. My best sport was soccer, but my love was basketball.” That’s something he hopes to follow as a fan here in Richmond. Nathaniel’s love of sports shifted to a passion for the arts in junior high school. He was fifteen when he recognized that dance was a skill he was going to need. “It was my love of musical theatre that got me dancing,” he says. Virginia Rep’s Peter and the Starcatcher charmed Central Virginia audiences in 2015. It was Nathaniel’s trial run directing for the company. understand all of the details that go into creating a show from the other side of the table,” he says. He freelanced for about three years before the Paul Taylor Dance Company snatched him up for three seasons, from 2004 to 2006. As part of the company, he performed on legendary stages, such as Lincoln Center, and toured nationally and internationally. Nathaniel danced with Paul Taylor Dance Company before opting for the stage for musical theatre and directing. During his first week of rehearsals with the other leads, he “realized what a finely crafted, brilliantly structured play it is,” he says. “Many of these iconic musicals are legendary for a reason – because they are beautifully crafted. They are emotionally charged and emotionally accessible stories.” Those are the types of stories he wants to bring to Virginia Rep, everything from classics to new works and world premieres. Nathaniel met his wife, Lisa Rumbauskas, a dancer/actress and choreographer, in 2007 when both were appearing in West Side Story at a dinner theatre in Akron, Ohio. “Lisa’s family had teased her about meeting the man of her dreams in Ohio,” Nathaniel says, noting the two were attracted to each other from the very beginning. Unfortunately, Nathaniel seriously sprained his ankle in rehearsal and had to leave the show. “Whatever was there was cut off abruptly,” he says. Through it all, being a father and a husband are his proudest achievements. “The greatest driving force in my life is my family,” he says. Through its theatre productions for youth, Virginia Rep has been successful in talking to young people about difficult subjects. Nathaniel feels that every young person, whether challenged by economics or a sensory, social, or learning disability, should have an equal opportunity to be impacted by the arts. “Theatre, in addition to entertaining, can create a safe space to engage in challenging conversations that affect young people, ranging from our Hugs and Kisses program, which is our child sexual abuse prevention program, to what a young person has to go through to fit in at school,” he says. Nathaniel often considers himself an anomaly in the theatre world. He works in a very social business, for example, but doesn’t drink, and, in fact, has never had a drink. He says his success stems from his penchant for hard work. He’s fond of the phrase “patient persistence” to describe his work ethic. Richmond families will have a chance to get a read on him as he takes the artistic reins at Virginia Rep.